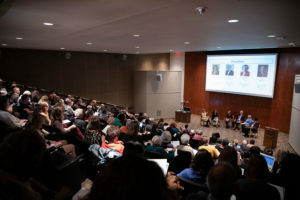 With more than 150 attendees at the April 3 Livability for Longevity Symposium, the Bass Lecture Hall at the LBJ School of Public Affairs was close to capacity. Between opening remarks from Council Member Alison Alter (District 10) about Austin’s efforts to create an age-friendly community and a thoughtful symposium wrap-up from Jesús Garza, former CEO of Seton Healthcare – and input from the audience (that included Luci Baines Johnson) throughout – it felt like the right people had assembled to discuss important issues about aging. View slides from the student presentation. 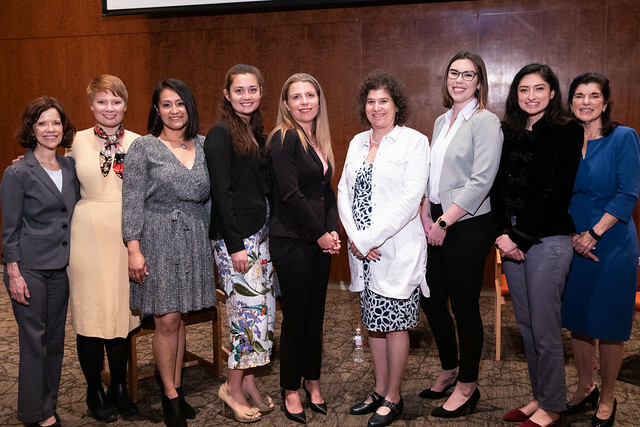 Find out more about the LBJ School team of researchers and presenters. A panel discussion, “Policy and Planning for an Age-friendly Austin,” followed the students’ presentation with real-world insight about the opportunities and challenges of aging-related policy implementation. Guest panelists included Janee Briesemeister, Chair, City of Austin Commission on Seniors; Adam Hauser, President and CEO, Meals on Wheels Central Texas; Annette Juba, Deputy Director, AGE of Central Texas; and Larry Wallace, Enterprise Chief Administrative Officer, Central Health. AustinUP extends huge thanks and appreciation to our co-hosts (LBJ School of Public Affairs, City of Austin Commission on Seniors), wonderful sponsors (Atria Senior Living, AARP Texas, St. David’s Foundation, Senior Resource Guide and Westminster) and exhibit partners (AGE of Central Texas, Capital City Village, Drive a Senior, Family Eldercare and Meals on Wheels Central Texas). YOU made this event possible! View more photos from the 2019 Livability for Longevity Symposium, courtesy of photographer Callie Richmond and the LBJ School.